I have been busy, busy again. It seems that things go bursts of busy in my life. That I won't be busy or doing to much in a day then all of a sudden it gets super busy with a million things that all have to be crammed into a couple days. I had planned a little get away for a couple days with my daughter, then a unexpected appointment came up so things got rearranged. It all worked out but changed a few plans, nothing major. Our get away just happened a bit later that's all. Crazy how stuff happens. So I get a couple days away with her, I am glad everything has worked out. I'm hoping that things get a little more organized and less chaotic from now on for a little while anyways. Ya right, LOL. I have been coloring some really great images from Whimsy Stamps and now will be making some inspiring creations to share. This cute little image is called Big Love from Marika Collins. I tried doing something a bit different with the image I tried using a glaze pen for a different effect, it turned out ok but the photo had a lot of glare cause of the glaze. I tried retaking the picture but could not get the clarity that I wanted. So this is my inspiration card for this week, I hope you can be inspired to create something different and wonderful today. I tried something different using a sewing zipper to make a flower. I like the effect that I got. I've never tried this before it was easy so I'm sure I'll use this technique again. 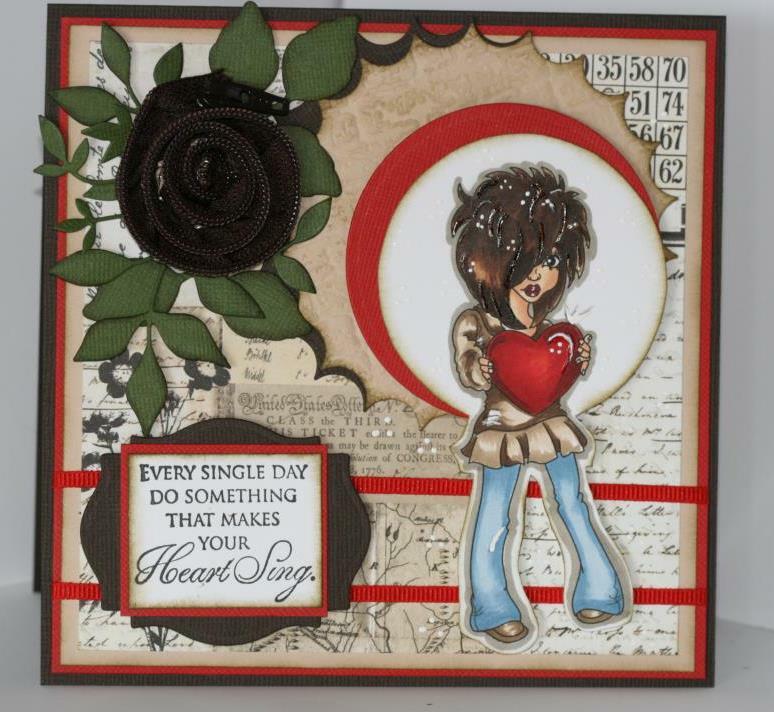 Supplies: Bazzill cardstock, Spellbinders- Label Eighteen, standard circles, Large inverted scalloped circle, Memory box Fresh Foliage, Penny Black sentiment eloquence, Tim Holtz bricks embossing folder. Hey nice card, love the white pen on there, very cool, nice flower! I seen them, and thought that would be cool, nice touch! WTG!